One of the Best Family Cars* is back again and all-new for the 2017 model year. Remodeled inside and out, the latest 2017 Honda CR-V in Arlington features new standard technologies, a fresh turbocharged engine and more cabin space. The model also sports a new exterior design made up of sharp lines, dramatic LED headlights, an Active Shutter Grille, a long hood and strong fenders. Take a gander at our 2017 Honda CR-V review for more details below. 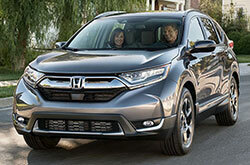 The new CR-V is offered in LX, EX, EX-L and Touring models. Across the lineup, you'll find a variety of attractive technologies that improve the driving experience. 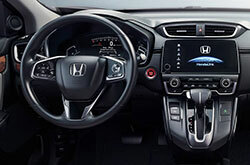 On the LX alone, buyers will find an electronic parking brake, automatic climate control, a 5-inch LCD display, Bluetooth, a USB port and a four-speaker system. EX models add keyless entry/start, heated front seats, a new 7-inch touchscreen with Apple CarPlay and Android Auto capabilities, a retractable cargo cover, a sunroof, heated mirrors and dual-zone automatic climate control. 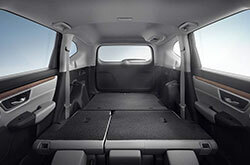 EX-L is fitted with a leather-wrapped steering wheel and shift knob, an eight-speaker sound system, HD radio, a power liftgate, leather seating and an auto-dimming rearview mirror. The range-topping Touring tacks on roof rails, navigation, automatic wipers, a hands-free power liftgate, ambient interior lighting and dual chrome exhaust tips. A turbocharged engine is offered on the 2017 Honda CR-V in Arlington for the first time ever. Equipped on EX, EX-L and Touring, the 1.5L DOHC direct-injected powerplant delivers 190 horsepower and 179 lb.-ft. of torque. It's also said to deliver the best fuel economy ratings. In addition to the new turbo, a 2.4L direct-injected four-cylinder, offering 184 horsepower and 180 lb.-ft. of torque, is found standard on the LX. 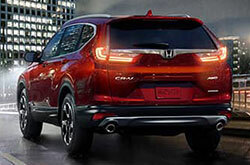 The usual antilock brakes, stability control, traction control and airbags are standard on the CR-V. EX trims and higher come with Honda Sensing, which adds Forward Collision Warning, Lane Keeping Assist, Lane Departure Warning, Adaptive Cruise Control, Road Departure Mitigation, Rear Cross Traffic Monitor and Auto High Beams. These advanced technologies have been highlighted in many 2017 Honda CR-V reviews. 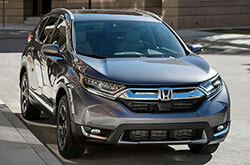 When searching for new vehicle models in the Dallas metro area, you may have seen the 2017 Ford Escape, Mazda CX-5 and the Hyundai Tucson, but the 2017 Honda CR-V is also a deserving option. Due to its cabin features, eye-catching design and fresh personality, it could be just the vehicle for you. 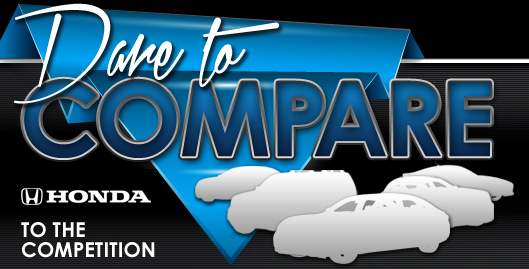 Utilize our review and try out the comparison tool to see if the 2017 Honda CR-V is right for you. Also view factory offers while you're here! Among our truly expansive collection of cars, the Honda CR-V is a sought-after option at our Honda dealership. We've provided this 2017 Honda CR-V review because it's critical to make an authoritative decision when you're searching for a car. You are guaranteed be blown away when you visit Vandergriff Honda to test drive the Honda CR-V; we welcome you to come see the model upfront. For those who'd like to see it now, we've embedded a video clip that spotlights its equipment. *Get Today's Price is available to all customers and can also be obtained by calling or coming into the dealership today. Purchase prices do not include tax, title, license and $150.00 doc fee. Prices include the listed offers and incentives. Please verify all information. We are not responsible for typographical, technical, or misprint errors. Inventory is subject to prior sale. Contact us via phone or email for more details. *MPG Based on 2017 EPA mileage ratings. Use for comparison purposes only. Your mileage will vary depending on driving conditions, how you drive and maintain your vehicle, battery-pack age/condition, and other factors. *For more information visit KBB.com. Kelly Blue Book is a registered trademark of Kelly Blue Book Co inc. 2017 CR-V won the 2 row SUV category.